Symbolism and funerary art found in cemeteries is not limited to the gravestones. Rich detail and iconography can also be found in the gates and iron work that surround many graves and adorn mausoleums. 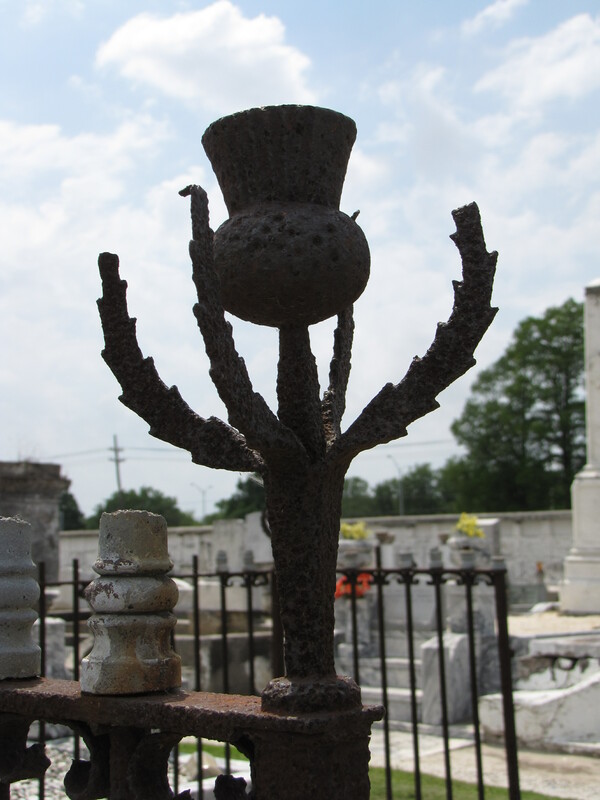 The Cypress Grove Cemetery in New Orleans, Louisiana, has many samples of ornate metal work. One of the graves is surrounded by iron work topped by thistles. Unfortunately, the gravestone is missing. The thistle is characterized by a purple or red flower that rests in a cup-shaped part of the stem and has prickly leaves and thorns that protect it from plant-eating animals. The thistle is in the family Asteraceae. This flower, like so many symbols in funerary art, represents many different things. For instance, the thistle, with its thorns, can symbolize the Passion of Christ. The thorns on the plant remind the Christian viewer of Christ’s crown of thorns. It is also a symbol of earthly sorrow. After Adam ate of the tree of life, God said to Adam that the ground was cursed to him for disobeying Him and that Adam would eat in sorrow. God said that, “Thorns also and thistles shall it bring forth to thee…”. The thistle is also the floral symbol of Scotland most likely adopted by the Scots because, as legend has it, a Norse army was about to attack a Scottish army encampment when an opposing soldier stepped on a thistle. The soldier cried out alerting the Scots to the presence of the Norsemen. This legend is also likely to be the origin of the Scottish motto, Nemo me impune lacessit, which is translated as No one attacks me with impunity or No one can harm me unpunished. The motto is a fitting slogan for the thistle, as well, because to eat it or pick it, one has to overcome the thorns.